Galarneau, Claude. "Collège des Jésuites". The Canadian Encyclopedia, 04 March 2015, Historica Canada. 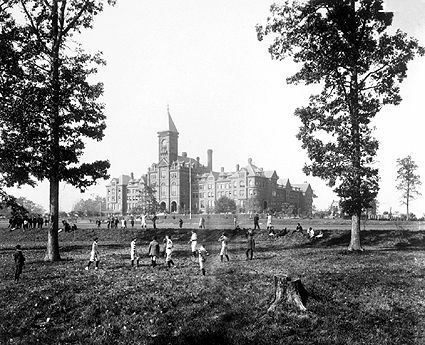 https://www.thecanadianencyclopedia.ca/en/article/college-des-jesuites. Accessed 24 April 2019. During the Counter-Reformation, the Jesuits wished above all to attract Christian youth by creating colleges throughout Europe. 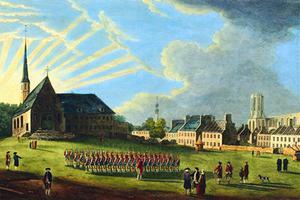 Arriving in Canada in 1625, they received a gift from the marquis de Gamaches to establish a college in Québec City. The doors opened in 1635 and the course of study was complete 30 years later. 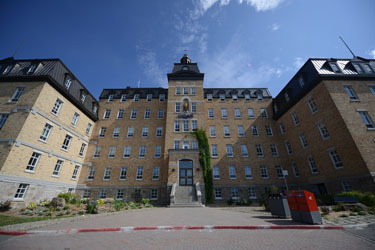 In 1668, Monseigneur LAVAL, bishop of Québec, founded the SÉMINAIRE DE QUÉBEC to prepare future priests for his diocese and sent his students to study at this neighbouring Jesuit college. The Collège des Jésuites taught theology and the sciences as well as classical studies. As they had already done in several coastal cities in France, the Jesuits in 1708 opened a hydrography school where they taught mathematics, astronomy and physics to prepare young Canadians for jobs as navigators and surveyors. An estimated 1700 students attended the Collège des Jésuites, more than half of them being students from the Petit Séminaire. These pupils were drawn much more from the Québec than from the Montréal region. Louis JOLLIET is one of the most famous alumni of the college. The professors all came from France. Scholastics, students of theology, came in their twenties to teach the grammar classes for 2 or 3 years before returning to France. The priests came in their thirties and spent at least a quarter century in New France, alternating between their roles as professor and missionary to the natives. Some devoted themselves entirely to education. The college had among its professors Father Pierre-François-Xavier de CHARLEVOIX, once Voltaire's master, whose Histoire et description générale de la Nouvelle France was published in Paris in 1744. The college was built after 1640 in the style of such colleges in France, with 4 right-angled wings around an interior courtyard. An exterior chapel was added in the early 18th century. In 1759 the college became the barracks of the British army and was destroyed after their departure to make way for the present city hall.